Once upon a time, all Homo sapiens lived in Africa. The experts pinpoint the location to be at Omo Kibish in Ethiopia. It all started there. Every human alive today can be traced back to these first people through our DNA. Encoded in our genes is the evidence of the great migration, which eventually led the descendants of a small group of Africans to occupy even the farthest reaches of the Earth. The earliest fossil records for modern Homo sapiens tell our African story. Africa is where we first evolved, and where we have spent the majority of our time on Earth. In those days we were likely all the same. Relatively speaking, our skin colour was similar, our eyes were brown, and our hair was dark. Race or ancestry was not a distinguishing factor, like it is today. According to the genetic and paleontological record, we started to leave Africa, likely due to climactic changes. Experts believe that a sudden cooling of the earth, around the time of the last ice age made life very bad for our African ancestors. The evidence shows that the population was in decline and may have dropped to fewer than 10,000 people. Unlike the movies, where a big event causes swift action, the cooling planet and the population decline is not what got us moving. Once the climate improved and our numbers started to bounce back, a few intrepid travellers set out. This first migration out of Africa, hugged the coastline of Asia toward Indonesia. A feat in and of itself to get that far. Over time, many more would continue until they reached Australia. 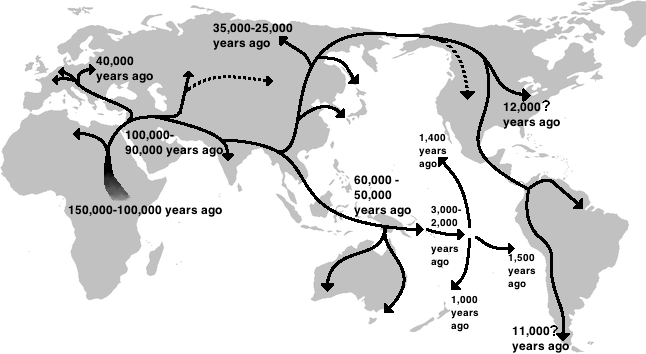 The second migration would lead humans into the land that would become the fertile crescent. Those would eventually became some of the earliest farmers. The creation and growth of agriculture led to cultural changes that have been linked to the development of art, textiles, religion, and other hallmarks of human civilization. Even in those early days, our collective desire and need to be creative were paramount to our success. From Northeast Africa, the nomads headed into the grasslands of Asia. These early modern humans met and mixed with earlier hominids like the Neanderthals and Denisovans, and traces of hominid DNA can still be found in people today. Then we went North to central Asia. An epic inland trek across Asia where some crossed a temporary land bridge that connected Asia and present-day Alaska during the last ice age to settle in the Americas. Many more migration routes sprang up. Some across Africa and further exploration beyond the 2 main out of Africa routes. During all this travel and time, tens of thousands of years, the gene pool continued to become diversified. We crossed back into other regions, mixing with people who had taken different migration routes over time. We evolved as we moved along, just like every other species of plant or animal on our planet has done. Somewhere along the way, genetic mutations started to appear, as would be expected. Experts have linked the mutation for blue eyes back to a single person. Lighter skin tones became prevalent. The expression of that genetic mutation may possibly have resulted from the adaptive need for absorption of vitamin D from the sun, in Northern environments. Red hair, blond hair, more and more genetic mutations, until we started to look very different from each other, depending on where we lived. In the last 500 years, global migration has increased by an extraordinary rate. We are in another wave of DNA evolution. It is an exciting time to be alive and watch the face of people changing again. Because worldwide travel is easier than it has ever been in our history, we are seeing massive changes, once again. This time, it is all happening really quickly. Nobody can say for certain which gene mutations or expressions will become dominate in the future. As the climate changes and the natural world evolves, our physical bodies will bear witness to the result. Maybe we will become more unified in the way we look, as might be expected from a population constantly on the move. Only time will tell. One of the interesting aspects of being a traveller, is to see how similar we all are. Maybe not in how we look, but in who we are. In each of hearts is a quest for very similar things. We insist on basic human rights. We want our children to be healthy, happy and to prosper. We hope to leave a legacy of our time here. We desire loving relationships and deep connections to others. We do well when we all thrive. That may sound like a utopia and possibly it is too idealistic to be real. I only hope that those who have the most, can have enough empathy to see what success might look like for all, not just for the 1%. If those who won the birth lottery can give a little more and take a little less, the result could be profound. This may take a little creative thinking. But the effort will not only appreciated by those who receive kindness, but the giver feels great as well. ← Can there be peace in a world of disparity?